A recent analysis of homes done by UCLA Berkley researchers found that a green labeled home (LEED for Homes, NAHB Green, Energy Star, etc) had a mearurably higher value than non-green (standard) homes. Researchers from UC Berkeley and UCLA have found that green home labels typically add almost 9% to the value of a California home. 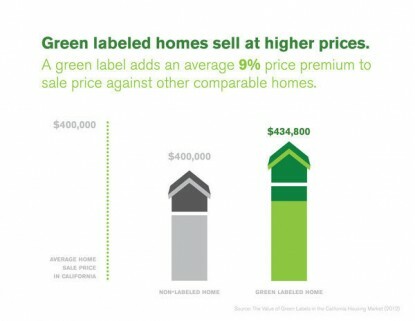 The “Value of Green Labels in the California Housing Market” study found that a typical California home valued at $400,000 sells for an average of 8.7%, or $34,800, more when it has a green certification label. The study was conducted by researchers with UC Berkeley and UCLA who hoped to answer the question: Does the investment in an energy-efficient home pay off during resale? The short answer is yes. According to the study, price premiums resulting from green certification were closer to 12% in hotter parts of the state. It also found the premiums were strongly correlated with an area’s environmental ideology as measured by the number of hybrid vehicle registrations — a phenomenon dubbed “the Prius effect” by visiting UC Berkeley professor Nils Kok, who led the study. Even though buyers of green homes were likely to save an average of $700 in energy bills annually, “consumers value aspects other than just energy savings alone when purchasing a green home,” said Kok, who cited intangibles such as enhanced indoor air quality and better insulation. The study estimated that the cost of making a home 35% more efficient was $10,000, “so the benefit of green homes far outweighs the cost,” Kok said. What about areas outside California? Well increasingly as more regional areas add green MLS fields that support identification of green home features, it is becoming easier for real estate appraisers to identify the local impact on market value. Learn more at our Green Real Estate Toolkit.